PHUKET: The Royal Thai Navy Third Area Command arrested 27 Burmese en route to Phuket aboard a fishing boat off the coast of Ranong on February 10. The group were charged with entering the country illegally and were taken ashore to be prepared for deportation. The arrest was made by the staff of HTMS Chonburi under the supervision of Lt Commander Warawut Seejarak. “We intercepted the Burmese immigrants along the southwest shore of Koh Chang Island, off the coast of Muang District Ranong,” he said. A preliminary investigation revealed that the group began their journey from the former Burmese capital Rangoon. They left Koh Song Province in Burma, west of Ranong, hoping to make landfall in Phang Nga. From there they were to meet an unnamed Thai “agent” who would take them the rest of the way to Phuket. Each was prepared to pay 3,500 baht for the service, he said. A mobile phone used by the Burmese to contact the agent was seized as part of the ongoing investigation, he said. All of the Burmese were transported to the Pak Nam Police Station in Ranong and prepared for deportation. 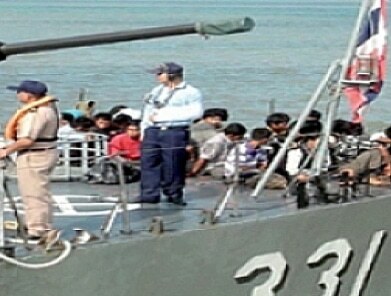 Two days before the capture of the Burmese, 85 Rohingya men and boys were intercepted off the coast of Satun. The group was reportedly headed for Malaysia when they were spotted by national park rangers and arrested by local police. The Rohingya are stateless Muslim people whose homeland is between the borders of Burma and Bangladesh, neither of which claim them as citizens. At this time of year, when seas are relatively calm, they often set out in boats toward Malaysia in search of a better life. However, there is a small community of Rohingya living in Phuket and making a living selling Indian crepe known as roti, a source in the Special Branch Police told the Gazette.